This morning when I was going to the Complex for a work out there was a family in front of me in the place where we place our transport for a while. The family was a mother and a boy and a girl that I had never seen before. The girl was of the age when they do the wobbly walk (less than two). The little girl looked at me,pointed and said "grand dad" and blew me a kiss. This story is mostly in Basic English. "Philosophical" is not a Basic English word. The Basic for "philosopher" is "wise man". Now,we eighty years after Basic was invented,might say "wise man or woman". But even this is not correct, to my mind. For I think the little girl is also wise and we should say that "A philosopher is a wise person". 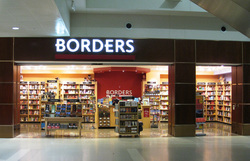 In the picture, there is the word "BORDERS". Basic for "border" is "edge"or "side". But all names are Basic. If the little girl said "Grandad" she is wrong for I never saw her before. If she said "grand dad", she might be right . A grand dad is a male parent of your parent. But parent is not a Basic word and is another level of fiction. If you think the little girl has a mind, then you can contact me and we can talk.